Re: Wordsworth - Reloaded painting cliffs. Looking good Mike ! I know exactly what you mean about the feeling you get when you've been away from the layout fora while, unfortunately I rarely get it because the car is kept in garage and I have to go to school every day and on the weekend I'm always working on the layout! keep up the brillant work ! poliss wrote: As I said, the news about Marklin going bust appears to be three years old. Where did you get your info from Harry? What are your thoughts on it? 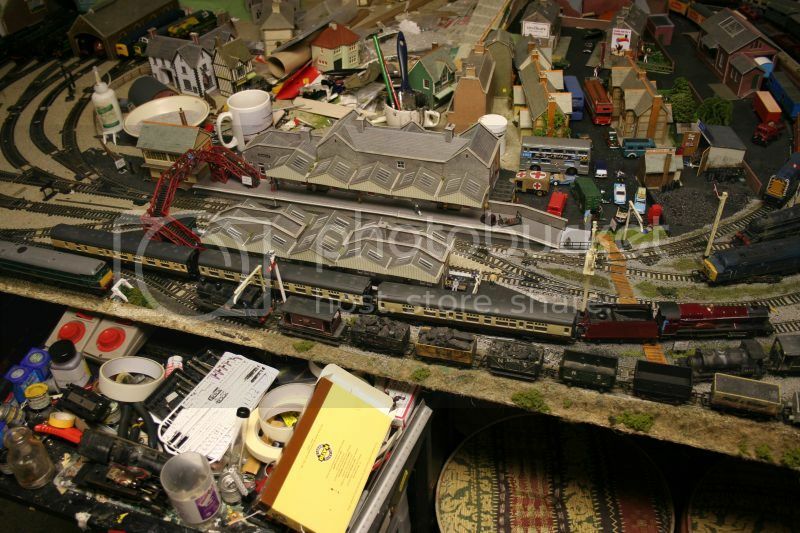 I am upset since it is one of the oldest companies in the model railway world. But I have the problem of being the son! Re: Ranelagh Bridge in 7mm west London stabling point. wow so does that mean you helped build Hatton Bank or Brinklow? is he on the workbench amongst the clutter? Nice work on that track but what are those brass thingies at the end of the two nearest sidings? Lovely clean work on those platforms John but possibly a few washed of black and or grey to bring out the mortar gaps? Topic: My First Attic Layout - "Aston Magna"
Re: My First Attic Layout - "Aston Magna"
That is a magnificent bridge! Sand me that one for inspection and make another one anyway!